I bookmarked this site a year or so ago and then forgot about it. I open the link today and find another very good site for pressure cooker users. The author is a woman named Barbara who states “I started Pressure Cooking Today to share my love of pressure cooking and challenge myself to create and share fabulous new recipes”. The “tips” section links to articles on the benefits of pressure cooking; gift guides; how to use pressure cookers, both in general and brand specific; how to convert a conventional recipe to a pressure cooker recipe; and how to get a pan out of a pressure cooker (for instance, when you place a cake pan in a pressure cooker). Recipes? There are a lot. Most are written by the site’s author (if not, the guest writer is introduced), and she includes a discussion of the recipe. Ads, ads, ads. But I am getting used to this fact of life on the internet. The recipes below are ones I might like to try and/or cover the scope of the recipes on this site. p.s. these worked out great! At this point, both authors state to put the potatoes through a ricer (I do have one of these) or food mill or use a potato masher (have one of these too). Then, add melted butter and warmed milk or cream. My family tradition is to add butter and milk and cheese and mash with a portable mixer. I never warm the milk or melt the butter, and I also add cheddar cheese and some sour cream. I am going to stick to my tradition, and mixer-mash the potatoes right in the pressure cooker pot. Then, I can cover them with a lid and turn the pot to “warm”. That way, I lessen the burden on my crowded stove top, which will be full of pots and pans making gravy and cooking peas and beans for our Thanksgiving dinner. Country-Style Barbecue Pork Ribs. I often find country-style pork ribs on sale. This boneless cut of meat is often very fatty. Barbara states “Cooking them in the pressure cooker helps melt away the fat and leaves fork tender meat”. The ribs are cooked in a sauce of crushed pineapple, ketchup, onions, dry mustard, and fresh ginger. Bone-In Beef Short Ribs. I tried these, and although the recipe worked, I don’t like the beef short ribs I get in my local stores. Too much bone, too much fat, too little meat. The meat is sort of tough and the flavor is not stupendous. Lemon Cranberry Breakfast Farro. Someone else has discovered farro! I covered it in my grains posts series. Frozen, boneless chicken breasts. Forgot to thaw something for dinner? No problem – just put a couple boneless breasts in the pressure cooker, cook on high for one minute, and you have thawed chicken breasts, just lightly cooked on the very outside and ready to be diced for recipes. Need an idea for dinner using said breasts? Try one of these pressure cooker recipes: Chicken Bacon Penne Pasta in a Garlic Cream Sauce, Honey Sesame Chicken, Chicken Enchilada Pasta (Rotel tomatoes, enchilada sauce, rotini pasta, lots of cheese, and the rotini is cooked directly in the sauce). And these are just a few of her suggestions. Pressure Cooker Mongolian Beef. This recipe calls for flank steak, fresh ginger and garlic, soy sauce, brown sugar, and green onions. It’s “a pressure cooker version of PF Changs popular beef dish”. Boneless Pork Chops. This recipe is like the “no-peek” beef dish that I used to make, often in a slow cooker, with mushrooms and a packet of dried onion soup mix. The thickness of the pork chops is discussed, which is helpful to me. There are other pork chop recipes too on this site. Also browse this site’s soup and dessert categories, if you are interested. I remember allrecipes.com from way back when it was solely a gathering of recipes contributed by cooks who also happened to be on the internet at the time. The web was mostly educational and personal sites back then, although it was changing rapidly. According to Wilipedia, “Allrecipes.com was founded in 1997 after co-founder Hunt had trouble finding his favorite cookie recipe on the Internet.” The first domain name was actually “cookierecipe.com”, but it quickly expanded to all foods and the name changed to allrecipes.com. And allrecipes.com became commercial, both onsite and as a print magazine. In 2006 allrecipes was sold to Reader’s Digest, and in 2012 it became part of the Meredith Corporation. I went to the Way Back machine and found this stored web visit that shows how allrecipes.com looked then: 1997 www.allrecipes.com. That’s how I remember it! Back in the day. Still, this site has a wealth of recipes. There are hundreds of pressure cooker recipes, all contributed by ordinary folk who are usually identified by a clickable link. Many have their own websites (like me). The thing about the allrecipes.com website is that there is no underlying theme for the style of recipes, except maybe “American style”. What I mean is, on seriouseats.com, the recipes are written by a handful of professional cooks. And on seriouseats.com, there are fewer recipes, most have an international flair, and the photos are amazing, as compared to the allrecipes.com site. Note: When you are searching for a pressure cooker from the above allrecipes.com link, you need to specify “pressure cooker” or “instant pot” when you search, or you get a conglomeration of pressure and non-pressure recipes. The recipe I want to try from allrecipes.com is Chicken with Duck Sauce. We really like the way chicken in the pressure cooker comes out juicy but done. This recipe calls for a whole chicken, cut up. I decide to use less chicken: just two, bone-in chicken breasts. Will the amount of liquid in the dish and the cooking time need to be varied? I don’t think so, so I will go ahead with the 1/4 cup wine plus 1/4 cup broth that is suggested for a whole chicken, and go with the instructions “cook on high pressure 8 minutes, or until done” (quick release). I make a full recipe of the duck sauce. First, I brown the seasoned chicken breasts directly inside the electric pressure cooker. Advantage: no separate stove-top skillet to wash. Disadvantage: I have to peer over the rim of the deep pot and reach down with a fork to turn them, and it splatters all over my hand. Can I skip the browning step altogether? No, un-browned chicken would look pale on the serving dish. I add the water and wine and close the cooker. It comes to high pressure quickly because there is so little water and food in it. After 8 minutes, I check the chicken breasts. One is up to 160˚, but one is only at 120˚. So I take one out, and leave the other in for another 2 minutes. It is done, 160˚. I was kind of wondering why the recipe instructions state: “cook on high pressure 8 minutes, or until done”. I mean, it’s not like stove-top simmering or oven-baking chicken when it takes just a second or two to check if it’s done. No, you have to release the pressure, check the chicken, then decide to cook a little longer. With this particular recipe – very little liquid and quick release – this “checking” step took only a couple minutes start to finish. So it worked. When cooking large amounts of food, like when I cook a batch of beans, it can take 10-20 minutes to check for done-ness and get the cooker back up to pressure. I made the whole amount of duck sauce even though I was only cooking two pieces of chicken, and was glad I did. Some of it pooled over into my hot side dish of freekeh and broccoli and it tasted great. I used fresh ginger, and I strongly recommend it if you have some around. The sauce was simply delicious, almost sweet and sour. We both liked it. Below, I am sharing several more recipes from the allrecipes.com collection. Some I am interested in trying, some demonstrate cooking methods, all demonstrate the scope of recipes the site includes. Instapot Salsa Chicken. This calls for frozen chicken breasts – and they are added without thawing to the pot. This could be a real boon for those times we walk in the door ready to eat and nothing is thawed for dinner. (We live 6 miles from a small town so going out is not always convenient.) I almost always have frozen chicken breasts on hand. So, I could put them in the pot, add salsa and a couple other ingredients, and pressure cook for 15 minutes. A healthy dinner in 15 minutes! Instructions for beginning with thawed chicken breasts are given. Double Bean and Ham Soup begins with non-soaked dry navy beans, and therefore will nicely season those beans. I find it odd that the recipe also calls for a can of pork and beans. What’s the point of cooking from scratch if you add such a processed canned product? Messy Lasagna. Ingredients are ground beef, tomato sauce, spinach, ricotta, mozzarella, and more. The pasta is bow ties. Pressure Cooker Lasagna calls for no-boil noodles and goat cheese and more. Pressure Cooker Bone-In Pork Chops, Baked Potatoes, and Carrots is interesting because you put the potatoes and carrots in a steamer basket inside the pressure cooker instead of down in the liquid. Beef Brisket with Chipotle Tomatillo Sauce calls for medium pressure for 1 hour 15 minutes. I think this is silly, why not high pressure for less time?, this might be a good idea. Slow release, too. Olive oil pressure-cooked whole roasted chicken. Nice spices, very little liquid. The cooking time is 16-20 minutes with quick release. The whole chicken is removed from the pressure cooker and browned under an oven broiler. The cooking liquid is made into a gravy for mashed potatoes. Spicy Pressure Cooker Short Ribs are cooked in a spicy sauce that includes – cola! The pressure cooker should be a good tool for cooking short ribs, a tasty meat that needs a long cooking time. The site includes other short rib recipes too. Note: I tried these, the flavoring was good, but the ribs disappointing. The kind I get at the market are simply too fatty, with very little meat. And they are not even cheap. I think I will give up on beef short ribs! Mexican Beef and Vegetable Stew is an example of how to cook a quick beef stew in the pressure cooker. The meat is browned and then pressure-cooked for 10 minutes, slow release. The the potatoes and carrots are added and it is cooked for 15 minutes, quick release. In general, the allrecipes.com site has many versions of recipes for pot roast, pulled pork, stews, carnitas, barbecued pork, and chilis. It is a good resource for ideas. Hardboiled Eggs in the pressure cooker take about the same amount of time, but the claim is that they will always be easy to peel. Chocolate Mousse Cheesecake This cheesecake is rich with cream cheese, semi-sweet chocolate and cocoa, whipping cream, eggs, sugar, cinnamon, and chocolate cookie crumbs. It’s pressure cooked for 45 minutes in a springform pan on a trivet. Copycat V-8 Juice! Boy, that would be fun. You start with fresh vegetables. If I had a garden, I would probably try this project. It’s processed in a “pressure canner”, not a pressure cooker. I used to have a very old pressure canner, but it’s gone off somewhere, so I’d have to purchase a new one to try this V-8 juice. According to the National Center for Home Food Preservation, electric pressure cookers are not recommended for canning tasks. Pressure canners are usually taller and bigger than electric pressure cookers, and can hold four or more quart-size jars standing upright. These canning cookers get up to higher temperatures than the electric type. The NCHFP has not tested whether or not electric pressure cookers get up to and sustain a high enough temperature to kill all the bacteria. I just ate a fantastic grain breakfast. How did I do it? Yesterday afternoon, I went to my pantry and selected four grains. How did I choose them? Well, I wanted something with big grains and crunchy, and something small and flavorful too. I chose kamut, einkorn (farro), and millet. I poured them into a pan (no measuring!) and added water to cover by about an inch. A little salt. I simmered until the grains were done, adding more water once or twice. Then I added a little old fashioned oatmeal, to sort of bind them all together. Cooked a few minutes, added sultans, covered, and took off the heat. Left there until morning. Morning comes. I warm up my mixture. Delicious!! This needs no sugar at all, just a little milk (and the sultans!). Yum. I thinks my mixture is a lot better than the 7-grain cereal blend that I have purchased for years. The flavors stand out and the grains are pleasantly chewy. Cereal for breakfast is especially good after months of eggs. We spent months successfully losing weight on a low-carb diet, but I for one missed my grains. Now I am using these whole grains that I studied, knowing they are full of nutrients, fiber, and even protein. The ones I chose have a relatively low glycemic index. No blood sugar spikes like eating sugary muffins. I don’t even have to look up recipes to use my favorite grains. Besides the morning cereal, a week ago I added teff flour to muffins just based on my own knowledge. They were delicious. 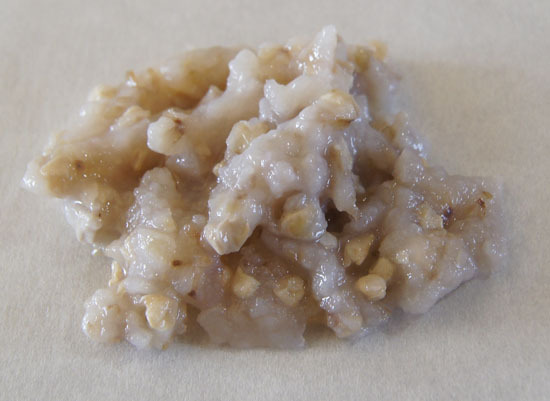 I have learned that I like grains that are in one piece, like wheat berries. 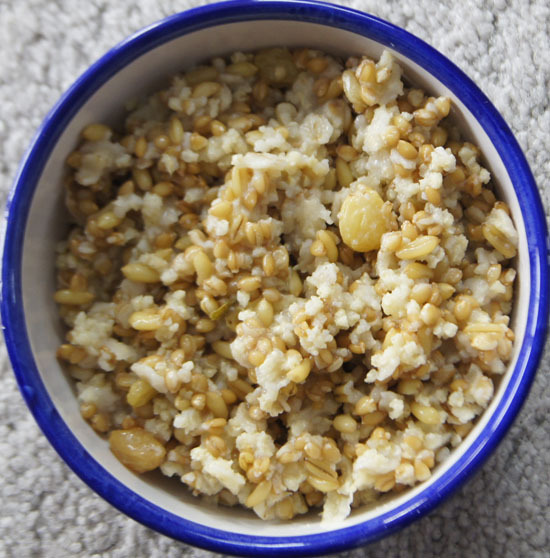 I know that whole grains can be “whole”, as in, in one piece, or lightly processed, like bulgur and cracked freekeh, which are treated just enough to change the texture but not too much to remove all of the fiber and attached nutrients. Grains can be processed into flour and still be considered “whole grain”. I know that a product called grain might be a grass, like wheat, or a seed, like millet. I have learned enough to use my own knowledge to choose and cook grains, but I have some great references on hand, my own charts, my own weblinks, and Whole Grains Every Day, Every Way by Lorna Sass. But I am “pausing” on my grain posts. Time to get on to my pressure cooker and other interests. November 2018. Winter is creeping in on Colorado. It’s time again for hearty stews and soups. Back in January 2017, I started a draft of this post “Electric pressure cooker recipes”, and now it’s time to finally finish it! I have been using pressure cookers since the 1970s, when I got my first stove top version. (See my 250 Cookbook post, the Presto Pressure Cooker Recipe Book.) About 4 years ago I got an electric pressure cooker, sometimes called an “instant pot”. I tend to neglect it since I store it down in the basement. So, I carried it upstairs for convenient storage. The focus of this series of posts is to find lots of pressure cooker recipes, test one from each website, and then keep all my references and notes in one convenient spot. I want to become very comfortable using my pressure cooker with foods from beans to grains to meats to vegetables. I am not going to discuss how to use a pressure cooker in this section. But for myself, I wanted a good reference book on pressure cooking, and I chose Pressure Perfect by Lorna Sass. (I bought the e-book.) I learned about Lorna Sass while working on my Grains posts, and purchased and reviewed her book Whole Grains Every Day, Every Way. I made a good choice with Pressure Perfect – I love the book! The Serious Eats Team has put together a page of 29 Pressure Cooker Recipes for Quicker, Easier Dinners. I became “acquainted” with one of this team, J. Kenji López-Alt, when listening to a podcast. After listening, I bought the hard copy of his 2015 book, The Food Lab: Better Home Cooking Through Science. (This book is past my 250 cookbooks era.) It’s a fascinating, scientific-style cookbook that totally appeals to me. The Food Lab book is huge and comprehensive and has lots of great photos. The pressure cooker recipes on the Serious Eats site range from traditional beef stew to chicken stew with lentils to Thai green chicken curry to black beans with chorizo to French onion soup to beef barley soup to Texas style chile con carne to rissotto to tomato sauce and chicken stock. Interesting flavors from Asia and India and America and Mexico and more are often woven into the same recipe. No borders in the cooking of the Food Lab Team! I like that the pressure cooker recipes on this site that call for black beans have you add the dry beans directly to the pot. A recipe with pinto beans calls for them to be soaked overnight, then added directly to the pot. A recipe for chick peas calls for canned beans. Why do I have a preference for adding dry beans directly to the pot? Because it lends a lot more flavor than adding precooked or canned beans, and it saves the cook (me!) from having to plan a meal by soaking the beans the day before. What I don’t like about the Serious Eats site are a couple of irritating ads: one keeps showing a video that distracts my eyes. The first recipe I want to try is 30-Minute Pressure Cooker Chicken With Chickpeas, Tomatoes, and Chorizo. This recipe was created by J. Kenji López-Alt. He writes about the development of the recipe on another page. He states that, as per my own preference, he tried dried garbanzos first, but it took so long for them to cook that he used canned garbanzos first. Gosh, I love his photos! I could learn more than cooking from J. Kenji López-Alt! I gather ingredients for this dish. I can’t find fire roasted tomatoes at the market, so I will use a can of Cento peeled Italian tomatoes. The chorizo is supposed to be the type that can be cut into chunks; I can only find ground fresh chorizo and a 3 ounce package of dried, cured chorizo precut into thin slices. (I added a small amount of the ground chorizo, cooked, and the entire package of cured chorizo, chopped into small pieces.) I do have smoked Spanish paprika in my spice rack. Garbanzos? I cooked dry garbanzo beans in my pressure cooker and stored portions in my freezer, so I will use those, but I don’t have quite enough so I will supplement with one 14-ounce can of garbanzos (chick peas). I have my own homemade chicken stock. For the chicken, Kenji may be able to cut one into serving pieces quickly, but not me – I choose packaged thighs and drumsticks. Yes, my pressure cooked chicken with chickpeas, tomatoes, and chorizo was wonderful. Even my husband liked it a lot. He thought the chicken was cooked to perfection, juicy and tender. He even ate the garbanzos. I thought the flavoring perfect. I advise anyone trying this recipe to be sure to use smoked paprika. Yes, the chorizo lent great flavor and heat, but what sets this dish apart is the smoky flavor of the paprika. One whole tablespoon – don’t skimp! I will try more recipes from this Serious Eats site. They keep adding pressure cooker recipes: the first time I visited the site there were 15, now there are 29. So keep checking back. Traveling through the web searching for information on millet for the Grains section of my blog, I came across this book by a woman called Lorna Sass: Whole Grains Every Day, Every Way. Just who is this woman? I preview parts of the cookbook and decide that I must have it. Shall I purchase Whole Grains Every Day, Every Way as an e-book or hard copy? My thoughts follow. First, let’s meet Lorna Sass, then I’ll ramble about e-books. I learned about Lorna Sass while reading the Whole Grains Council section on millet. She is one of their culinary advisors, as listed on this web page. Whole Grains Council (WGC) has a bio page for Lorna Sass, where I learn that she is a widely published food writer and an award-winning cookbook author. I follow their link to her website and read more of her biography. Sass begins her bio with “my mom was a good cook, and a very adventurous one” and that she “grew up with a relaxed sense of cooking good food”. She did not begin her career as a food writer, no, she graduated from Columbia University with a PhD in medieval literature. During her studies, serendipity led her to a 1390 book of recipes from the royal household of Richard II. Aha! A woman after my own heart – she checked out the book and started cooking the recipes! I enjoyed learning about one more great cook who is fascinated by food, likes to try new things, steers toward whole grains and home cooked meals, and writes cookbooks. Sass has a presence on Facebook and a blog. More about her story is found on her WordPress “about” page. All of my current cookbooks are hard copy publications. I like sitting in a comfy chair and perusing recipes and stories and photos of food. I like writing notes in the books or inserting hand-written post-its to mark ideas and suggestions. Can I really sit down with a book that is on my iPad or computer instead of paper? There is something about turning the pages of a printed, paper book that is comforting. E-books might work for me, though. I could access an e-book from my phone, my iPad, and my computer. I could be in a store and look up a recipe so I know what I need to by. Or, I could sit in a chair with the iPad or my MacBookPro and swipe through the pages. Or, I could sit here at my desk with a big screen and all my stuff around me, with access to all of my databases and writings and notes. And, I could have the e-book immediately. No waiting. No waste of paper, no book to find space for on a shelf. The e-book costs less than the printed book. I don’t have to travel to a brick and mortar store and maybe not find it (or pay a lot). I won’t have a lot of packaging to recycle from an online purchase shipment. All these things considered, plus with a choice to try something new, I decide to try this cookbook as an e-book. The download is quick and voilá, it is on my computer. How do I like using the e-book? I have read e-books on occasion, but not a lot, so I need to get familiar with the functions. I’m using the Kindle app on all my devices. So, I start playing around with all of them. I find that I can add a note anywhere in the book. The notes I add on my computer version are synched with both my iPhone and iPad versions, and visa versa. This is very useful! I like being able to search for a word (e.g., an ingredient) and go directly to that page. I think I will like this method of using cookbooks. Especially for this cookbook, which is mostly information and recipes – no photos. How do I like Whole Grains Every Day, Every Way? Wow. I really like this book. If I had found it sooner, I probably would not have started the Grains section of my blog. Sass begins with “what is a whole grain”. I am always going on about whole grains when talking to friends and family, and I like having this reference at the ready so I can keep my facts straight. “A kernel of grain is comprised of three edible parts: the bran, the germ, and the endosperm. Some grains have a fourth part – the hull or husk – which is an inedible protective covering.” And “In order to qualify as a whole grain, a kernel must have all three parts intact.” If a grain is processed into pieces, like wheat into bulgur, or any grain into flour, the processed grain must have the same nutrition profile as the kernel to be called “whole grain”, according to USDA guidelines and the Whole Grains Council. Look for the word “whole” in labels of grain products. In a whole grain, the bran contains dietary fiber, B vitamins, and trace minerals. The germ contains vitamins B and E, essential fatty acids, phytochemicals, and unsaturated lipids. Here is a direct quote from Whole Grains Every Day, Every Way: “The germ is located at one end of the kernel near where the kernel connects to the stalk, since it is just under the bran, if the bran is removed, so is the germ.” The endosperm is the largest portion of the kernel, and contains starch and protein and B vitamins. Some of the grains she covers are seeds or pseudocereals. For instance, quinoa, amaranth, and millet are not members of the grain family in botanical terms, but are commonly referred to as grains because they are cooked like them and have similar nutritional profiles. I’ve run into this definition before while studying grains for my Grains section of my blog. Sass methodically studied how to cook each grain. Just like a scientist! She has a section titled “In my kitchen laboratory”. Her kitchen experiments included pre-soaking the grain (or not); putting the grain in boiling water or starting with the grain in cold water and then bringing to a boil; toasting before cooking; adding salt early or late; letting a grain stand covered after cooking; pressure cooking; and adding oil (or not). Because of all of her cooking trials, I find Sass’s cooking instructions for each grain easy to follow, full of excellent suggestions, and so far, perfect for each grain I’ve tried. Sass talks about cooking grains in large batches to create your own “grain bank”. Most grains store well in the freezer, and can be frozen in small portions for last minute use. I learned about this method when I wrote my Grains post on kamut from the Food Storage Moms website. For each grain, Sass tells us what sort of foods they go well with in a compatible foods and flavors section. For instance, amaranth is compatible with savory ingredients such as butter, olive oil, sun-dried tomatoes, mushrooms, oregano, corn, sesame seeds, and fresh ginger, and sweet ingredients such as honey, vanilla, chocolate, cinnamon, banana, and winter squash. The recipes are all at the end of the book. This is nice in an e-book, because when she mentions the recipe in the text of a grain’s section, it is hyperlinked directly to the recipe. The “further reading” chapter at the end of the book is wonderful. One link I found that I really like is the USDA Food Composition Databases website. I put it in my browser’s tool bar so I can easily find the nutrition profile of just about any food. At the very end is a hyperlinked index. This may not be as necessary as in the print version, since you can always do a word search in an e-book. The only drawbacks to this book is that it was published in 2006, so some of the information might be outdated, and that it does not have photos of grains. I am happy with my decision to buy the e-book, and I am totally happy that I found and now own Lorna Sass’s Whole Grains Every Day, Every Way. Thus reads the package of Bob’s Red Mill whole grain hulled millet that I hold in my hands. The millet is small and round and sort of yellow-tan in color. I want to learn more about this ancient grain! Millet is the generic name for a group of small-seeded grasses. The most prominent types of millet are finger, pearl, foxtail, proso, and little millet. 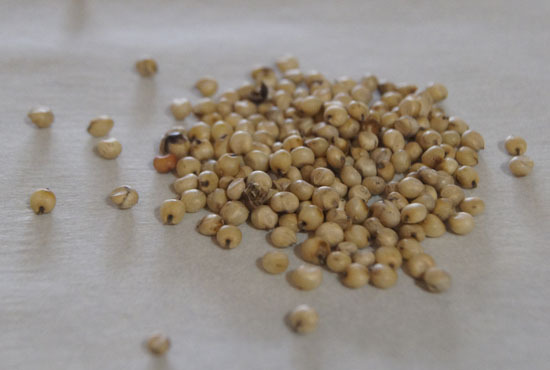 One less popular type called great millet is actually sorghum bicolor. 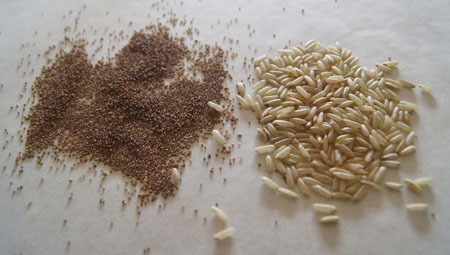 White and black fonios are related to millet, as I learned while writing my post on fonio. Millet grows well in hot and dry climates and has a short growing season. According to Wikipedia, 97% of the world’s millet is produced in developing countries in Asia and Africa. Millet is “whole” because it includes the bran, germ, and endosperm. It is also gluten free. Millet was a “Grain of the Month” on the Oldways Whole Grain Council website. It’s thought that before rice, millet was the staple grain in Asia. Today, in India, millet is used to make the flat bread roti, a staple ﬂat bread. 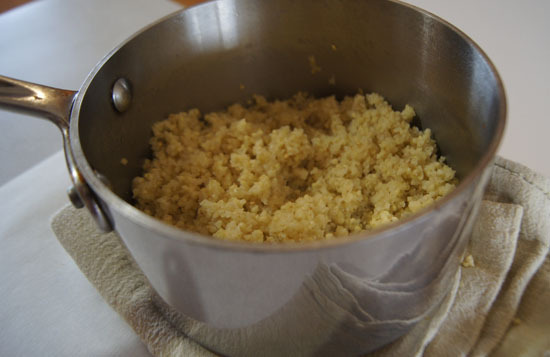 In Africa, millet is generally cooked as a porridge. And, it is used to make beer. I learn from Whole Grains Every Day, Every Way that In the US, proso is the most common millet. And what is it used for here? Birdseed! Health food stores began selling millet for people, and then gluten-free diets increased its popularity. Now millet is pretty easy to find in many types of markets, as well as online. 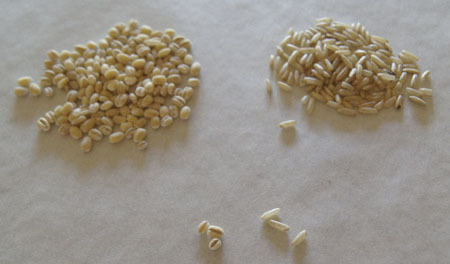 Bob’s Red Mill has a good blog entry that is a comparison of four grains: millet, quinoa, barley, and amaranth. I also like an entry The World’s Healthiest Foods: “Although millet is most often associated as the main ingredient in bird seed, it is not just ‘for the birds.’ Creamy like mashed potatoes or fluffy like rice, millet is a delicious grain that can accompany many types of food. As with most grains, millet is available in markets throughout the year.” An Encyclopedia Britannica article has wonderful photos and also illustrations that show how grains are milled. I did find one caution about consumption of large amounts of millet. 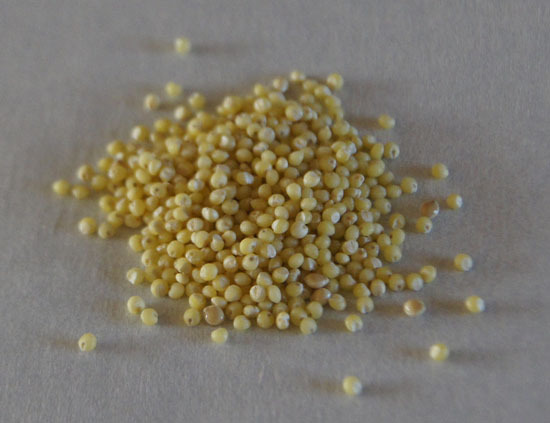 Some types of millet contain goitrogens. What are these? They are substances that suppress thyroid activity and can lead to goiters, or enlargement of the thyroid gland. (Reference: The Healthy Home Economist.) Why It Matters What Type of Millet You Eat is a fun to read article by Chris Masterjohn, PhD. He explains that proso millet is okay – and from what he found out from Bob’s Red Mill and what I found out from Lorna Sass, proso millet is the type of millet we are most likely to obtain in the United States. 1/4 cup of dry millet (55 grams) has 210 calories, 3 grams fiber, 5 grams protein, 8% iron, 12% niacin, 8% vitamin B6, 8% folate, 8% riboflavin, 14% thiamin, 40% manganese, 14% phosphorus, 4% zinc, and 15% magnesium. The glycemic index values for millet range from 45 to 71, depending on the type of millet and how much the grain is processed. The World’s Healthiest Foods discusses other health benefits of millet. Fluﬀy: Toast 1 cup millet for 4-6 minutes in a dry pan over medium heat, until it begins popping and emits a toasty aroma. Off heat, carefully add 2 ¼ cups boiling water, 1/4 teaspoon salt, and 1/2 tablespoon butter. Cover and simmer 13-18 minutes until most of the water is absorbed, then let stand 10 minutes. Fluff up before serving. Use like you would rice. Sticky: Don’t toast the millet. Put 1 cup millet in a pan with 2 ¾ cups water and 1/4 teaspoon salt, simmer for 13-18 minutes, then let stand 10 minutes. Sticky millet can be molded in croquettes and patties or pressed into a pan. Creamy: Start with millet “grits”, or make your own by grinding 1 cup millet in a spice grinder, 1/2 cup at a time, into a coarse meal. Bring 5 cups water (with 1/4 teaspoon salt) to a boil, then gradually whisk in the ground millet. Cover, lower heat and simmer, stirring occasionally for 15 to 30 minutes until grits are tender (the length of time depends in the size of the grits and the altitude). Creamy millet is good as a breakfast porridge, or it can be used like polenta. Millet can be used like rice, as a porridge, like mashed potatoes, and in many other dishes. It kind of depends on how you cook it. The “fluffy” way would work great under a spicy sauce or in a tabouleh style salad. The flavor is pleasant and not dominating. Actually, I think it would be great with some Mexican flavors, and served along with beans as a side for enchiladas and the like. Here are examples of recipes from “Whole Grains Every Day, Every Way”. Teff is a tiny grain from Africa. I learn from the Bob’s Red Mill package that it is the smallest grain in the world, and “It has long been an important food for Highland Ethiopians, who use it to make everything from bread to beer.” It is one of the ancient grains, it is a grass, and it is gluten free. Teff comes in black, brown, and ivory varieties. It is sold as the whole grain and as flour. Teff is championed in the US by Wayne Carlson, much as is kamut by Bob Quinn and fonio by Pierre Thiam. Carlson’s company website is The Teff Company. 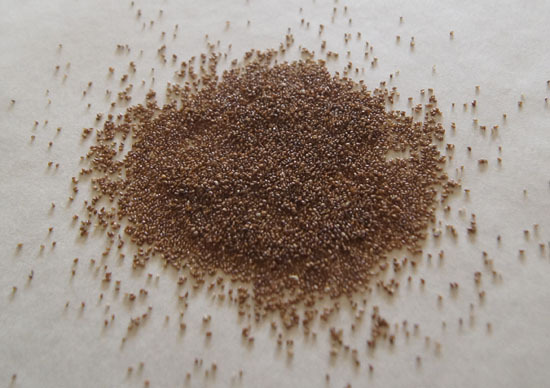 The company produces the teff under the brand name Maskal Teff. Carlson first became interested in teff while living in Ethiopia during the early 1970s. Here is a direct quote from the website: “He lived as a guest of the local farming community, and found the farmers eager to show their crops. Wayne became devoted to the local food, and soon discovered that while the farmers had a wide variety of crops, they preferred to grow and eat teff.” The Teff Company found Idaho to have an ideal climate for growing teff. A 2016 New York Times article states that the Ethiopian government prohibits its farmers from exporting teff in order to keep teff affordable in Ethiopia. This comes from the lesson learned from quinoa, originally a staple in the diets of many South Americans but now unaffordable by many locals. (I discussed this briefly in my post on fonio.) The Ethiopian government would like to make black, brown, and ivory teff varieties protected brands, much like Ethiopian coffees. The NY Times article also states that teff is high in protein and iron, has more calcium and vitamin C than “almost any other grain”, and much of its fiber is a resistant starch that might improve blood sugar levels. Teff kernels cook up like a porridge, according to the websites I visited. I might get more use out of this grain if I buy the flour and incorporate it into breads. But let’s see first if I even like the taste! The whole teff I purchased from Bob’s red mill is brown. And, it is about the size of poppy seeds. 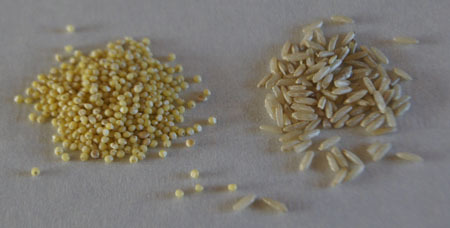 Teff compared to medium grain brown rice. Teff is gluten-free, an important consideration for those on gluten free diets. Teff is a whole grain. The above cooking time is for brown teff. Check the package instructions if you find one of the other varieties of teff. I cooked 1/4 cup of Bob’s Red Mill brown teff and it yielded 3/4 cup cooked. The kernels never get real soggy, and when cooked, sort of have the texture of poppy seeds. I liked the taste! Slightly sweet, definitely not bitter, a bit earthy, and pleasing. The texture – like poppy seeds – is unusual, but not necessarily bad. I think I’d like to try keff mixed with oatmeal and other grains as a breakfast cereal. Teff is a natural for hot breakfast cereal, perhaps mixed with other grains for variety. I made the “Teff Porridge with Dates and Honey”, a recipe on the Bob’s Red Mill package, and it was delicious. For that recipe, the dry teff is toasted in the cooking pan and then the water is added. It’s simmered for 10 minutes, then the dates and honey and cloves (I used cinnamon) are stirred in and the mixture cooked until thick and yummy. 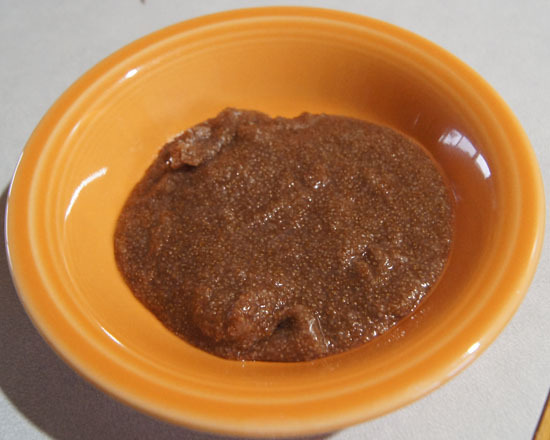 In Ethiopia, teff is used to make traditional injera bread. Injera bread is often used as a bowl for stews, kind of like a wrap or flatbread. Links to recipes using teff are below. 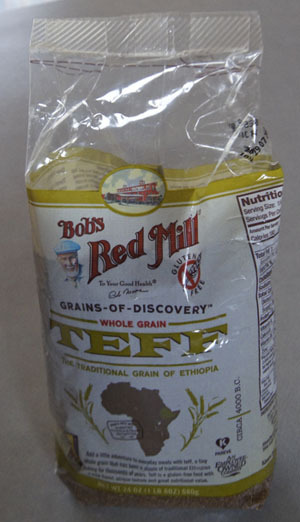 The first group are recipes for injera, and the next two groups are the Teff Company and Bob’s Red Mill sample recipes. Note that injera is made from teff flour. Indeed, at least of half of the recipes in all the links below call for teff flour. I used to think buckwheat was a type of wheat. But no. Wheat is a grass, and buckwheat is not a grass, instead, it is a pseudocereal related to sorrel and rhubarb. So why the heck does it have “wheat” in its name? Because it is “used like wheat”, or because its triangular seeds look like the seeds of the beech nut tree – “beech wheat” somehow became “buckwheat”. (Wikipedia). Buckwheat is officially one of the ancient grains. It has been cultivated for thousands of years in Southeast Asia, Central Asia, Tibet, and Europe. It was brought to America by Russian immigrants and is still used in traditional dishes. 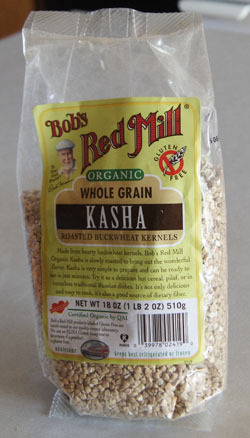 I bought a package of “kasha” from Bob’s Red Mill. Kasha is (roasted) buckwheat kernels. Kasha lacks only the husk, and is therefore a whole grain. I have buckwheat flour in my pantry, for use in yeast breads, quick breads, and pancakes. 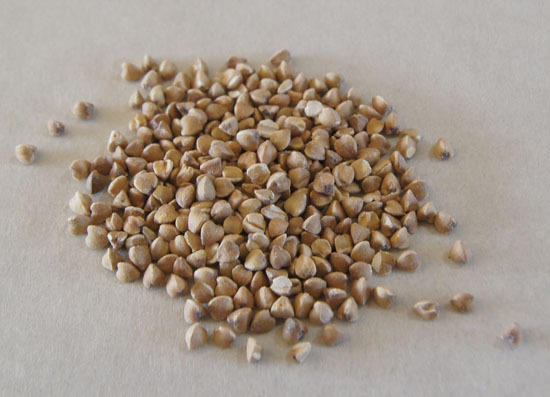 Buckwheat is a gluten-free grain, and this has helped increase its popularity in Western countries. I used to associate “kasha” with the cereals under the “Kashi” brand. For years, this was my “healthy dry cereal” for breakfast. Kashi does have some buckwheat in most of its cereals, but their website does not talk about kasha. Buckwheat is a topic in some of my early health food books, bread books, a pasta book, and a nutrition book. While covering PastaMatic MX700, I took the time to look it up and first discovered that it is not really wheat. In my Handbook of the Nutritional Contents of Foods post, I learned that it has a nutrient profile similar to wheat, but it has a lower glycemic index. PastaMatic MX700 has a recipe for buckwheat noodles. Eat, Drink and Be Healthy, published in 1971, advises the reader to “look for milling companies in your area and ask them about wheat germ, whole-grain flour, buckwheat, peanut, rice, and other flours”. The Tassajara Bread Book, published in 1970, encourages the use of rye, corn, millet, barley, rice, oats and buckwheat flours in breads. Vegetariana has several recipes that include buckwheat. 1000 Vegetarian Recipes tells me that “it’s uncommon to find buckwheat in its raw form. Most often people confuse kasha, which is roasted buckwheat, for raw”. I bought my buckwheat flour while writing the Handbook of the Nutritional Contents of Foods post. This flour is bluish-purple in color. I used it as part of the flour in a loaf of My Daily Bread. The bread cooked up beautifully, albeit bluish-purple in color, but I really cannot stand the taste of buckwheat! It stinks too! The kasha I bought for this post is not bluish-purple, so maybe they will taste better than the buckwheat flour. I open the package and sniff the kernels. They do not have the same stink as the buckwheat flour. Maybe they will taste good . . . but no. I cooked them according to the package instructions and I don’t like the taste! They are bitter, and just not to my liking. 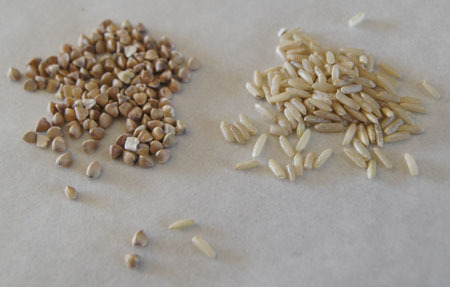 Kasha compared to medium grain brown rice. Bob’s Red Mill: 1 cup dry cooks to about 3 cups. Be aware that kasha can come in medium and fine types, or it may not be whole grain and it may not be roasted. I suggest to cook according to the package instructions, if you have it. The values for kasha purchased from Bob’s Red Mill: 1/4 cup of kasha has 160 calories, 2 grams fiber, 5 grams protein, some iron and potassium. From the nutritionalvalue.org site, I find that kasha has these RDAs: 13% niacin, 11% thiamin, 5% riboflavin, 12% vitamin B6, 4% vitamin K, 11% copper, 9% iron, 26% magnesium, 43% manganese, 14% phosphorus, 3% selenium, and 9% zinc. Buckwheat groats are used as porridge and in hot and cold side dishes, much like farro, freekeh, and wheat berries. Buckwheat flour is used in quick breads, yeast breads, noodles, and pancakes (regular, blinis, and crepes). Buckwheat honey, strong and dark, is available through several online sources. Buckwheat pancakes are called blinis in Russia and galettes in France. In India, foods made from buckwheat flour are enjoyed, especially on fasting days. 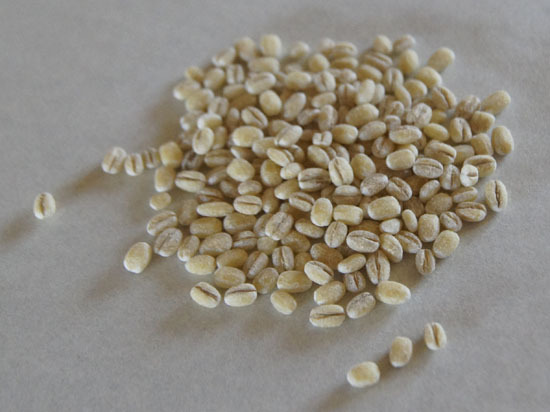 Buckwheat is used in several Asian cuisines, for instance, Japanese soba noodles. Kasha Purifying Soup, with lentils, yellow split peas, kasha, onions, carrots, celery, garlic, and spices. Kasha with Jicama and Apples. I always keep barley in my pantry. I like adding it to soups, especially beef soup. But I’ve only used it in soups, and I know very little about it. There must be more to discover about this old grain! Barley was domesticated around 19,000 years ago (Wikipedia). Wild barley still exists in western Asia and Northeast Africa, but domesticated barley is the type widely available today. I don’t think all the barley we get is considered an “heirloom grain” as is farro, but it is considered ancient. (Humans discovered barley and farro in the same time frame.) Today, barley is ranked as the 4th most popular grain in the world, behind maize, rice, and wheat. There are about fifty “cultivars” of barley today. Fifty! A cultivar is a “plant variety that has been produced in cultivation by selective breeding”, according to Google’s dictionary. Most of the cultivars, or varieties, have a hull that is very tough and inedible. That hull must be removed before we can eat it. And yes, hulling the barley removes some of the nutrients. The processed form of barley called “dehulled barley” (confusingly this may also be labeled “hulled” barley) is considered a whole grain because it still has its bran and germ. According to the Old Grains Council, dehulled (or “pot”) barley is available at health food stores, but it takes a very long time to cook. Most of the barley we see in our markets is “pearl barley”. Pearl barley is dehulled barley that has been steamed to remove the bran, and then polished in a process called “pearling”. (Wikipedia). Another form of barley, “hulless” varieties (cultivars), are available through Bob’s Red Mill and Shiloh Farms (labelled either “hull-less” or “hulless”). Hulless barley never had a hull to lose! Instant or quick barley is available from Quaker Oats. It cooks in just 10 minutes. So: unless you buy the instant type of barley, it will take a long time to cook, so plan ahead. Cooked barley has a chewy texture and good flavor. It barley can be used in side dishes, salads, main dishes, soups and more – much like wheat berries, farro, and sorghum. Barley flakes and grits can be cooked into porridge. Barley is processed into flour and used in breads. Different barley products are used in commercial packaged foods. Beer! Beer and whiskey are more reasons why barley is so popular world-wide. How is that? Barley is made into malt! I learned this when I covered malt syrup in one of my posts in 250 Cookbooks, Blue Ribbon Malt Extract. The barley is soaked in water just until it sprouts and then it is dried – a process called malting. Barley malt helps the fermentation process and adds flavor to beers and whiskeys. I use barley malt routinely in yeast bread baking. Experts say that it helps the yeast grow, yielding lighter bread loaves. For bagels, I add barley malt to the bagel-boiling water, the step just before baking. It’s good to become re-acquainted with barley. I haven’t used it in months. I search my pantry and find some in my pantry, but I don’t know what type it is and I don’t know how old it is. I throw it out and start afresh. (Ah, this puts a new take on “old” grains.) First, I order a pearl barley online from Shiloh Farms. This must be a “lightly” pearled version, since it takes over an hour to cook. In a local health food store (Steamboat Mountain in Lyons), I come across (and purchase!) a bag of “hulled” barley. Since the store buys this barley in huge bags and re-distributes it, I don’t know what brand it is or how long to cook it. On my shelves, I also find a new and unopened package of barley flour that King Arthur Flour sent me when I ordered “ancient grain flour”. I’ll put all of these to good use in my kitchen experiments. Below is pearled barley compared to the barley I found at Steamboat Mountain. I am pretty sure it is what I called hulled, pot, or dehulled barley in the above paragraphs, with the husk removed but not pearled, and considered a whole grain because it still has its bran and germ intact. (I don’t think it is the hull-less cultivar.) 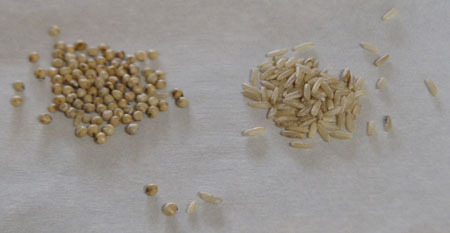 It is much darker than the Shiloh Farms pearl barley; below are the two compared, pearl on the left, hulled on the right. 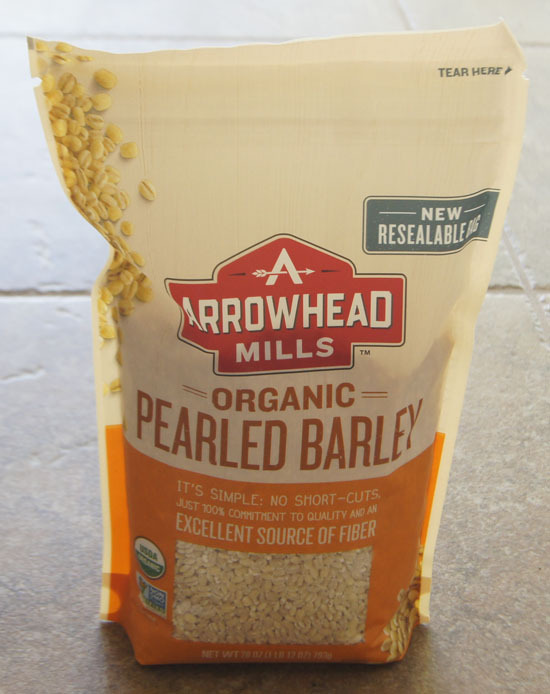 The values for pearl barley purchased from Shiloh Farms: 1/4 cup of barley has 160 calories, 7 grams fiber, and 4 grams protein. From the nutritionalvalue.org site, I find that barley (hulled) has these RDAs: 12% niacin, 22% thiamin, 8% riboflavin, 8% vitamin B6, 2% vitamin K, 13% copper, 10% iron, 16% magnesium, 49% manganese, 13% phosphorus, 27% selenium, and 9% zinc. I found varied values for the glycemic index (GI) for barley. Remember: lower values are better for diabetics (indicate “slow” grains for sugar release), and under 55 is good for a grain in general. I have two types of barley to cook: pearl barley and dehulled (pot) barley. The package of pearl barley says to cook 1 cup of pearl barley in 3 cups water 1 hour and fifteen minutes. My book, 1000 Vegetarian Recipes, says to cook 1 cup dehulled barley in 2 1/2 cups water for 1 hour and 20 minutes. I experimented. I started with the pearl barley and my pressure cooker. I cooked 1 cup in 2 cups water for 35 minutes, high pressure, fast release. All of the water was absorbed, and the barley was sticky and very done. If I tried pearl barley in the pressure cooker again, I’d start with 30 minutes. Note: 1 cup pearl barley yielded 3 cups cooked. 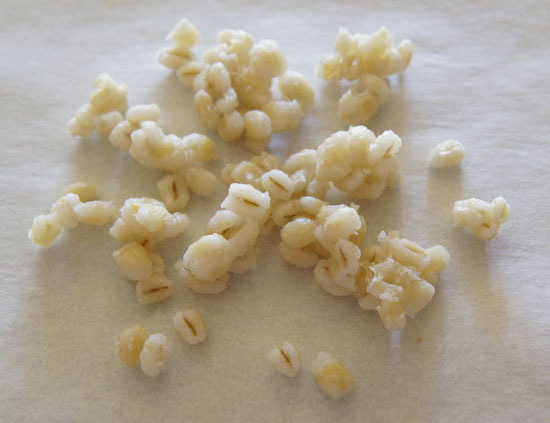 I cooked the dehulled barley in my pressure cooker, 1 cup barley and 2 cups water, for 30 minutes, high pressure, fast release. It was not done, so I cooked it another 5 minutes under high pressure, fast release. Perfect! Chewy and good. It had some water left and I drained it off. So, next time, 35 minuted in the pressure cooker. Let’s go back to the pearl barley. I want to make beef barley soup (I found this recipe on Cook’s Illustrated). I know my husband, and he would prefer the pearl barley. I wanted to cook the pearl barley in the soup itself so it could take up all of the flavors of the stock (my very good own beef stock) and the other ingredients of the soup, so I added it uncooked at the first simmer of the soup. I simmered the soup for 1/2 hour and checked the barley – it was not done. At 1 hour, though, it was just about perfect. I then left it standing off heat for another 1/2 hour and it was a lot softer than it was before I let it stand. In the future, I’d say, simmer Shiloh Farms pearl barley in a soup (or water) for about an hour, and it will be ready to serve immediately. Experiment! And then if you like it, always buy the same type of barley. Keep in mind that it might take over an hour to cook barley. Or, if you buy “instant” barley, it might take only 20-30 minutes. Recipes for barley abound on the internet. But in my own house? Well, my digitized collection of recipes calls for barley flour in tortillas, and for whole barley in beef soup. That’s it. In my cookbooks? A few of my health food cookbooks have recipes for whole barley and for barley flour. That’s it. I have an unopened package of barley flour that King Arthur Flour sent me when I ordered “ancient grain flour”. I opened it and added a half cup to My Daily Bread this week, but the loaf failed to rise well in the pre-baking step and baked into a dense (but well-flavored) loaf. The package suggests using barley flour to make soft tortillas – I think that’s the recipe to try next, or I’ll add it to muffins, or use less than 1/2 cup in a loaf of bread. But online? Recipes abound. In general, barley can be used anywhere rice is used. Or, like other intact grains in tabouleh-style salads. I’m listing some recipe links below. Sorghum – I always associate the word “sorghum” with syrup. In my cookbook Our Favorite Recipes, the pfefferneusse cookie recipe calls for 4 pounds of sorghum syrup (I did not try to find it!). I listed sorghum as an entry in Encyclopedia of Cookery, Vol. 10, but did not describe it. So I am going to pull that book off the shelf . . . I found a great reference for sorghum in an article on the Oldways Whole Grains Council website. 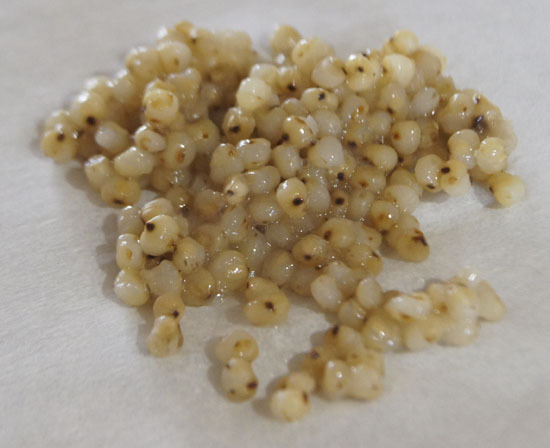 I learn that sorghum is known by many names: milo and guinea corn in West Africa, kaﬁr corn in South Africa, dura in Sudan, mtama in eastern Africa, jowar in Hindi, jola in Kannada, and kaoliang in China. Sorghum has an edible hull, and thus is common in whole grain form, retaining most of its nutrients. Another great reference is the Simply Sorghum site. 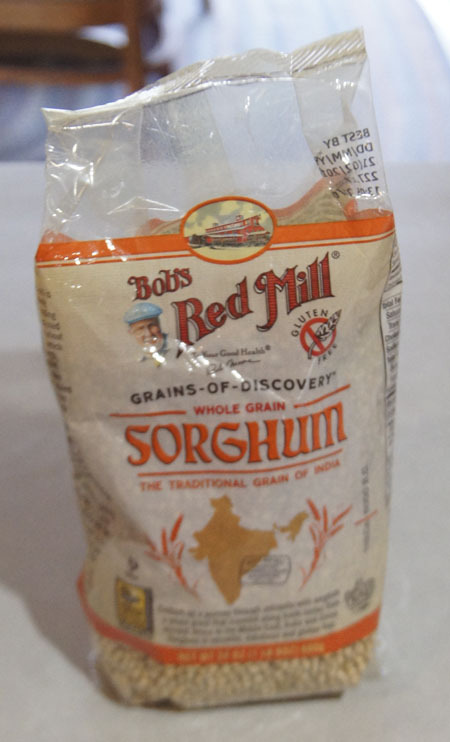 I learn that sorghum is available as the whole grain (this is what I have), pearled grain (outer husk removed), whole grain sorghum flour (milled with the hull), white sorghum flour (milled without the hull), sorghum bran and flakes (used most often in the food industry), and sorghum syrup. Sorghum syrup is still used as a sweetener, mostly in the South. For instance, it is used on pancakes and added to BBQ marinades and salad dressings. Sorghum syrup is less sweet than molasses and sugar because it lower in fructose. Benefits are that it is high in potassium. The Simply Sorghum site lists another sorghum product called “black sorghum”. Black sorghum was developed by Texas A&M University in the US. This is emerging as a “super food” as it is high in antioxidants and phytochemicals. Sorghum can be popped like popcorn! I just had to try doing this. I put it in a pan with a bit of oil and put it over high heat. A lid was not necessary, since the little kernels did not have enough oomph to jump out of the pan. Sorghum is one of the ancient grains. Most of the grain-sorghum that we find in stores in the US is whole grain (the hull is edible) but hulled or “pearl” sorghum is also available. Curious about the the availability of sorghum, I checked around and found Vitacost to have the widest variety of sorghum grains and flours (they even have sprouted grain sorghum flour) and popped sorghum snacks. A major “plus” for sorghum is that it is gluten free. This puts it with amaranth, fonio,and quinoa (and a few more more) as acceptable grains/pseudocereals for the thousands of people with celiac disease. 1/4 cup of dry whole grain sorghum has 180 calories, 8 grams fiber, 5 grams protein, and 8% of the RDA of iron and zinc. From the nutritionalvalue.org site, I find that sorghum also has these RDAs: 11% niacin, 11% thiamin, 8% vitamin B6, 4% vitamin K, 6% copper, 8% iron, 15% magnesium, 31% manganese, 14% phosphorus, and 5% zinc. Whole grain sorghum has a glycemic index of 62 (source: SimplySorghum). Anything under 55 is pretty good for a grain. Not to forget: sorghum is gluten-free. The Bob’s Red Mill package instructions say to cook whole grain sorghum 50-60 minutes on the stove top. Like with kamut, I immediately think “pressure cooker”, and sure enough, I find pressure cooker instructions on the Simply Sorghum site. Both sets of instructions are below. 1 cup dry sorghum yields about 2 1/2 cups cooked. 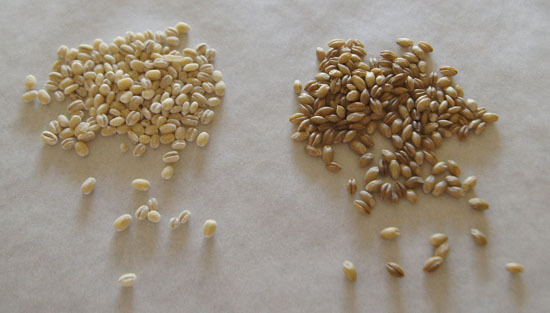 Sorghum can be used much like wheat berries, kamut, and farro. It is a large grain and more suitable for side and main dishes than porridge (at least, in the whole grain form). As a flour, it can be added to all sorts of baked goods. King Arthur Flour has several suggestions for using sorghum flour along with other gluten-free flours to make yeast and quick breads. 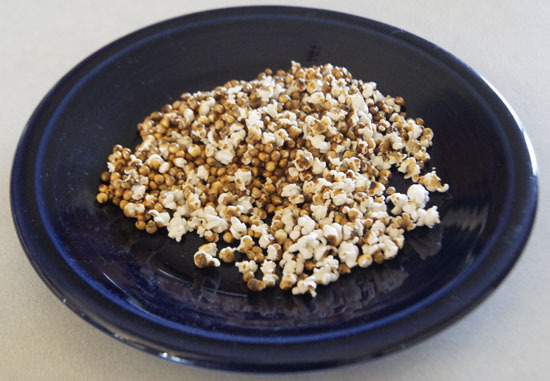 Popped sorghum can be eaten “as is” or added to snack bars, granola, salads, and desserts.